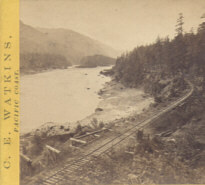 View of Columbia River, Middle Block House, Cascades. Carleton Watkins is appreciated today by historians and collectors for his stereo photography of the American West. Before doing stereo work Watkins was a successful photographer who produced many highly regarded images. As a consequence, his stereo photographs were relegated to obscurity by most art and photography historians in light of what they believed was his more important work with two-dimensional images and panorama. Recently, there has been something of a revival among historians to recognize Watkin's fine handling of the stereo image. He brought the same skillful handling of composition and landscape to his stereo work as he did to the regular two-dimensional photographs. Starting in 1999, a show including some two hundred examples of Watkins stereo photography taken from stereo cards has traveled to major art museums in the United States. To find "the best spot with the best view" was how Watkins described his idea of landscape photography. Watkins can be counted among the ranks of photographers exploring the visual landscape of the American West. Although better known for his images of Yosemite, made soon after the natural wonder was discovered, his first trip to the Columbia River in 1867 produced many fine stereo landscapes. His stereo landscapes from the Cascades garnered awards at the Paris International Exposition of 1868. It was the only medal awarded for California views as the backs of Watkins stereoviews published after the exposition proudly note. Watkins created an unparalleled visual record of the western United States during a time of change. His depictions of the industrial outposts tucked along the rivers and railroads (Central and Southern Pacific Railroads) of the Pacific coast capture the spirit of progress manifest in nineteenth-century America. Watkins images capture the sublime character of the West Coast's natural treasures. They are lyrical and poetic in their composition. And at the same time a concrete record of humanity's influence on nature. His achievement was not challenged until the work of Ansel Adams. Moreover, only recently have photographers acknowledged the legitimate presence and role the things we create play in landscape. In Waktin's forward looking compositions, the place occupied by humanity in nature is forthrightly addressed. He does not seek to avoid or paper over the creative and destructive presence of our architecture and engineering in the wilderness. His images of the developing West place humanity's encroachments on nature in an objective and artistic light. The scenes of isolated outposts and rail lines amidst the grand forests of the Pacific Northwest presage the environmental photography of the mid 20th century without sentimentalism or activism. His images display a sensitivity to the artifacts of industry as if they were an organic part of the natural world. Carleton Watkins was a Victorian landscape photographer who managed to achieve a balance between competing desires for artistic merit, a profitable business and social acknowledgement in his work. In later years he would suffer serious setbacks, such as the loss of his studio and negatives containing the work of a lifetime in the conflagration following the San Francisco earthquake of 1906. Biographical details: Carleton Emmons Watkins (1829-1916) was a pioneer California photographer, most well known for his photographs of Yosemite. You can help by adding any details you have about this photographer.